Foody is a Premium restaurant WordPress theme for restaurant, Foods and Recipes and other food related websites. It has various home page variations with 5+ independent section. Foody WordPress Theme is fully Optimized. Articles, Products itemscope added. Validated with standard coding styles. We've followed best Practices with Search Engine Optimized coding Styles. Foody is fully responsive and any device Friendly Theme. Build with Bootstrap 3+ and Fully compatible with Bootstrap Elements and classes which makes it easy to understand and customize anywhere you want. 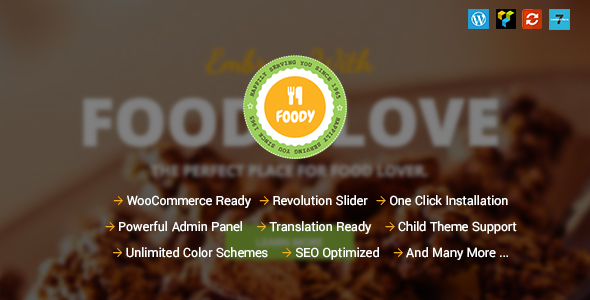 Thanks for purchasing Foody - restaurant WordPress Theme. If you face any problem which out of the scope of Documentation we've provided please create a Support Topics on our Support Forum.